Fetch, originally uploaded by The Bacher Family. 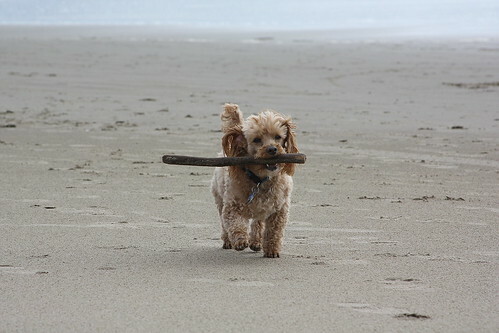 Walking along Cannon Beach during Spring Vacation, we encountered this very cute dog playing fetch with his owner. He was such a photogenic character that I stopped to take some pictures, and amazingly, he stood and posed for me -- then proceeded to trot right up to me, standing patiently while I petted him! His owner laughed and said that I brought it on myself by kneeling down to his level for the photo -- he was actually a trained companion dog who worked with people in nursing homes. With the owner's permission, we all played fetch with him for a while before moving on down the beach with memories of a new friend.